As we approach a society in which intelligent machines and humans coexist, machines will have to perceive and understand how humans and other embodied agents interact with the world. However, this is challenging since agents act in the world by moving and deforming their bodies which makes it difficult to establish correspondence between body parts and their changing visual appearance. My research goal is to develop systems that can make sense of deforming bodies in the 3D world. Such systems would enable: robots that learn by imitating people; markerless motion capture; and, ultimately, socially intelligent machines that understand human behavior. In pursuit of this vision, I have been developing methods for learning generative models of deformable 3D bodies and inferring their internal states from visual data. Specifically, my colleagues and I developed the first fully automatic method for recovering 3D meshes of humans from RGB images by fitting a deformable model. Recently, I combined the power of deep learning with geometric constraints to develop an end-to-end system that can infer 3D meshes of humans in real-time. I demonstrated the utility of recovering such a 3D representation by training a physically simulated agent to perform dynamic skills from YouTube videos. Finally, in addition to humans, I also developed methods for other deformable objects such as animals and birds where much less data and supervision is available. Angjoo Kanazawa is a postdoctoral researcher at UC, Berkeley advised by Jitendra Malik Alyosha Efros and Trevor Darrell. She received her PhD in Computer Science from the University of Maryland College Park where she was advised by David Jacobs and her Bachelor’s from New York University. 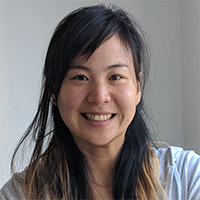 Her research is at the intersection of computer vision graphics and machine learning, focusing on 3D understanding of deformable shapes such as humans and animals from monocular images. Her work has received the best paper award at Eurographics 2016, and she is a recipient of Google Anita Borg Memorial Scholarship. She interned at Columbia University with Peter Belheumer, Google X self-driving car, NEC Labs America with Manmohan Chandraker, and Max Planck Institute with Michael Black.